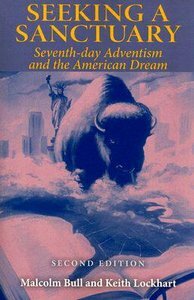 - Publisher One of the most successful of America's indigenous religious groups, the Adventist church has remained largely invisible. The completely revised second edition of "Seeking a Sanctuary" casts light on this marginal religion through its socio-historical context and discusses several Adventist figures that shaped the perception of this Christian sect. Malcolm Bull is a Fellow of St. Edmund Hall, Oxford. His publications on apocalypticism include "Seeing Things Hidden" and (editor) "Apocalypse Theory", contributions to numerous academic journals, and reviews in the "Times Literary Supplement" and "London Review of Books". Keith Lockhart is a London-based journalist who has worked for "The Observer", "The Independent", and the Press Association. He was a one-time teacher at a Seventh-day Adventist college and several of his former students were involved in the Waco siege. One of the most successful of America's indigenous religious groups, the Adventist church has remained largely invisible. The completely revised second edition of "Seeking a Sanctuary" casts light on this marginal religion through its socio-historical context and discusses several Adventist figures that shaped the perception of this Christian sect. Malcolm Bull is a Fellow of St. Edmund Hall, Oxford. His publications on apocalypticism include "Seeing Things Hidden" and (editor) "Apocalypse Theory", contributions to numerous academic journals, and reviews in the "Times Literary Supplement" and "London Review of Books". Keith Lockhart is a London-based journalist who has worked for "The Observer", "The Independent", and the Press Association. He was a one-time teacher at a Seventh-day Adventist college and several of his former students were involved in the Waco siege.